It is the early part of the nineteenth century and although New Englanders have been spreading their wings and moving ever further west for years Evelyn Brook, the daughter of wealthy Jonathan Baker, has lived in Maryland all her life and would never think of leaving. She doesn’t know how to cook, she doesn’t make her own clothes, and she doesn’t take care of her own children. That’s what servants are for. 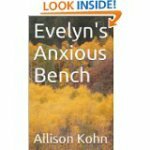 Evelyn does have a good education for a girl brought up in those days, and she is compelled by her father to teach school just long enough to get a taste of the power of independent thought. But after her marriage she settles down in a mold set by generations of the upper class in New England and is quite satisfied with her life, for the most part.